When we're with our dogs, our stress levels decrease, leaving us more relaxed and able to deal with life in ways that aren't harmful to our health. Every day when I wake up to my sweet pups' faces I wonder: How do people not have dogs? How do they handle stresses of everyday life without a pair of puppy dog eyes to gaze into as their heart melts? And that's not just me being mushy about my guys (even though they are pretty special!). While “dogs have been a part of peoples' lives for thousands of years,” says Rebecca A. Johnson, Ph.D, director of the Research Center for Human Animal Interaction at University of Missouri, they've evolved from working and living outside to living indoors as part of the family. We didn't let other working animals move into the house and sleep on our beds — why dogs? When we see, touch, hear or talk to our companion animals, beneficial neurohormones are released and that induces a sense of goodwill, joy, nurturing and happiness. “Over time the relationship has gotten closer and closer,” Johnson says. “Some would relate that to advancements in industrialization and technology. We live in a high-tech, low-touch world and people have a longing for a bond with nature.” Companion animals like dogs can be that bond. And these bonds “help us to feel good,” she says. 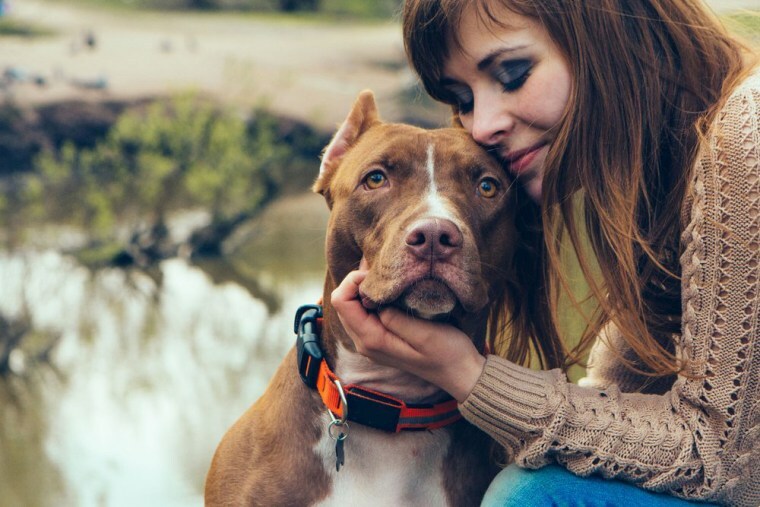 “When we see, touch, hear or talk to our companion animals,” beneficial neurohormones “are released and that induces a sense of goodwill, joy, nurturing and happiness.” At the same time, the stress hormone cortisol is suppressed. Heart rate, blood pressure and respiratory rate can all decrease, leaving us more relaxed “and able to manage stress in ways that aren't harmful to our health,” she explains. Steven Knight surrounded by his dogs and foster dogs. Having a dog “taught me how to trust again and how to build a relationship,” he adds. The bond between man and dog is something that can really cure a lot of emptiness. Dogs Matter steps in to place dogs who need a temporary home with foster families, and provides resources to care for the pet. Knowing their dog is ok allows people to focus on their recovery, Knight says. They're reunited when they're able to provide the care the dog needs, but it's the care the dog gives their person that makes the lasting impact. Dogs stay present in the moment. That's important for people in recovery, we try to not worry about the future as much. And dogs don't let their past define them. Knight is working to launch Dogs Matter programs across the country. But there's a whole world of other opportunity for dogs to make a difference. Another population that sees great benefit from dog companionship is older adults, says Johnson. Yet this is another group that often isn't able to keep their pets at a time they need them most. Many senior living facilities don't allow pets, and “if you think of the stress of having to move to a new place, and on top of it to have to give [their pet] up, it's unthinkable,” Johnson says. “So we started Tiger Place, where people move in with their pets and my team provides pet care assistance.” Residents get help with dog walking, grooming, and medication for their companion. “We need more places like this that promote this kind of interaction,” she says. Dogs also provide a communication bridge between older and younger generations, Johnson says. In fact, dogs in many social situations make for easier conversation, Johnson says, calling it a social lubricant effect. “People are likely to respond more positively to someone who has an animal with them. Animals give us permission to engage in ways we wouldn't otherwise, less formal ways, silly ways. But at a minimum animals provide a topic of conversation that's not stressful.” And that's helpful in settings ranging from workplaces — which are more and more allowing dogs — to hospitals and other settings where trained therapy dogs work.